Lambs to the Slaughter: What is the East Turkistan Islamic Movement and is it really a Terrorist Threat at the Olympics? Today’s news carried yet one more item about alleged Uyghur terrorism in China. According to Chinese sources, two Uyghur men, aged 28 and 33 respectively, drove a truck into a group of Chinese border guards during their morning marching exercises at a border post outside the city of Kashgar. The two Uyghur “terrorists,” then got out of the truck and reportedly stabbed several guards with knives, subsequently killing a total of sixteen guards and throwing two homemade grenades into the border guard barracks without resultant damage. The perpetrators were reportedly promptly arrested. With China’s “debutant ball” marking its induction into the leading nations of the global order about to begin Friday with the opening ceremonies of the Olympic games, this incident received a column in the New York Times as opposed to what would likely be a two inch news brief (if that) any other time. Even in a column-length story, however, the New York Times was unable to really examine the significance of this incident. Unfortunately, like all information pertaining to Uyghurs inside China, we cannot fully trust what we are told. According to the Chinese state, this incident was the work of the East Turkistan Islamic Movement (ETIM), which they also claim has links to Al-Qaeda. The ETIM is also recognized by the U.S. State Department as a terrorist organization and, by implication, an enemy of ours in the Global War on Terror. If thinking conspiratorially, however, one might be inclined to suggest that this entire incident was fabricated by the Chinese authorities prior to President Bush’s arrival in Beijing to discuss human rights among other things with Hu Jintao, intended to inspire sympathy in Bush concerning China’s security situation prior to the Olympics. While always a possibility given the controlled and unreliable nature of information in China, this is unlikely. Afterall, if the Chinese were to fake a terrorist attack, I would hope they would make it more frightening than a two-person knife attack on some remotely located border guards. In all likelihood, this incident did happen, but it is very unlikely that it was the work of a transnational terrorist organization, or at least a sophisticated one with links to Al-Qaeda, as claimed by the Chinese authorities. The reasons why the Uyghurs in Xinjiang may now be resorting to violence, albeit in isolated and disorganized bursts, are fairly clear. As I have noted elsewhere, the Uyghurs are staring in the eyes of cultural genocide. While Uyghurs have defied Chinese rule on various grounds since the eighteenth century, the urgency of this resistance is different today as China’s economic machine is rolling westward. Kashgar, close to where this latest conflict took place, is perhaps ground-zero for the confrontation between Uyghur culture and Chinese development. When I was last there in 2000, a newly constructed six lane highway emerged from nowhere in the desert to enter the city – the precursor to a massive face-lift for the city. 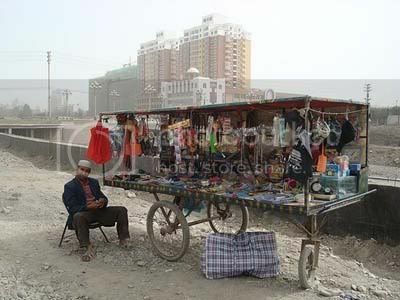 Over the last several years, large parts of the historical Uyghur city have been displaced to make way for Chinese construction as the Chinese state develops this ancient trading city into a modern port for its economic globalization strategy in the west. Meanwhile, the Chinese state is increasingly marginalizing the Uyghurs to make way for investors from China proper. In a discourse all too reminiscent of colonial and neo-colonial conquests past, the Chinese truly understand this development to be in the Uyghurs’ interest as it offers them an opportunity to replace their backward (i.e. Uyghur) culture with China’s peculiar brand of modernism. Most Uyghurs, however, do not see it that way. They see it as the last step before they disappear as a people, overwhelmed by ethnic Chinese migrants and the machinery of the Chinese state and its exploding industrialism. In this context, many Uyghurs, like Tibetans, view the Olympic Games in Beijing that open this week as perhaps their final opportunity to cry for help to the international community. Is this latest act of violence in Xinjiang then a desperate attempt to attract attention away from the birds nest stadium and NBC “color” stories about the Great Wall, Chinese food, the affect of smog on athletes, and Yao Ming’s ankle? Maybe, but, even if so, is it the work of the ETIM, and, if so, what does it tell us about this alleged dangerous terrorist group? Let's start with the basics - what and who is ETIM? Does this organization really exist, and, if so, who are they and what are they capable of doing? Well, the organization does exist on youtube at least(see below) in the form of the Islamic Party of East Turkistan and the East Turkistan Liberation Organization (which are frequently cited by the Chinese as wings of ETIM), but a lot of fictitious things exist on youtube. One Uyghur I know in the United States, however, has told me that a colleague of his had interviewed an ETIM member, who incidentally denied that the group had any links with Al-Qaeda. Furthermore, the Islamic Party of East Turkistan appears to once have had a website, but its sponsors have evidently let their contract expire as evidenced by the “suspended page” notice one gets when visiting the site. Unfortunately, beyond this, there is little reliable information about the ETIM, which the U.S. State Department so confidently recognized as a dangerous terrorist group. Wikipedia tells us that the founder and organizer of ETIM was Hasan Mahsum, but an extremely suspect report without footnotes from Singapore’s Institute of Defense and Strategic Studies (IDSS) tells us that Mahsum was the second leader of ETIM, while failing to tell us who its first leader was. Both sources claim that Mahsum was killed by the Pakistani military in Waziristan in 2003, and there is no mention of his successor. Youtube also offers us some footage that is allegedly of Mahsum in Afghanistan (see below). While this footage and the stories of Hasan Mahsum may or may not be true, it still tells us little about the ETIM and its alleged threat today. Even the Singaporean source, which is full of undocumented statements about the organization’s connection to Al-Qaeda, only provides us with the accounts of actual events during the 1990s. During this time, there was a larger presence of Uyghurs in Pakistan and Afghanistan, but by the late 1990s, China was courting both the Pakistani government and the Taliban to ensure that Uyghurs did not have access to the militant training camps in those countries. Ironically, therefore, some Uyghurs may have been training in militant camps Pakistan and Afghanistan in the early 1990s, but, if they were, they were likely wiped out or severely crippled by the time that the US declared ETIM a terrorist group on September 11, 2002. Since that time, China has repeatedly tried to suggest that ETIM is active and dangerous. In 2003, for example, the China Daily published profiles of 11 Uyghur alleged terrorists living abroad and reportedly linked to ETIM. While not all the names of these 11 Uyghurs are well known, at least two of them lead non-violent Uyghur activist organizations in the west and are unlikely to be linked to a terrorist group supposedly located remotely in the Pakistan/Afghan frontier. Furthermore, the Chinese authorities have continually claimed that virtually any political violence in Xinjiang is the work of the ETIM. Additionally, they claim to have both destroyed an ETIM training camp in the Pamir mountains last summer and foiled several ETIM terrorist attempts this summer, including the capture of an ETIM terror cell in Urumchi several weeks ago. Despite the alleged presence of this active and dangerous terror threat in Xinjiang, there have been no incidents that can be clearly defined as terrorism in the region in recent years. There have been no suicide bombers, no IEDs, and no hand-held rocket launcher attacks. Instead, we have several reports of terrorists with knives when it is well known that almost every adult Uyghur male carries a knife. Just two weeks ago, however, the Islamic Party of East Turkistan did claim credit for a bus bombing in Yunnan (which I believe was the first time such a public claim had been made), an incident that is more clearly covered by the traditional definition of terrorism. Ironically, the Chinese authorities were quick to deny that the bombing had anything to do with Uyghurs. We have yet to hear whether this group will claim credit for the incident near Kashgar, but even if they do, it still means very little, as the Chinese authorities themselves seem to suggest. So, the actual existence, capacity, and linkage to recent violent acts of the ETIM all remain murky questions by most accounts. If we are to take the various incidents blamed on the ETIM by Chinese authorities at face value, however, the organization appears to be very poorly equipped. Essentially, the list of weapons attributed to the ETIM by the Chinese have been knives, homemade grenades, and gasoline. All of these items could obviously be obtained without the benefit of links to Al-Qaeda or without ETIM itself. They could just as easily be developed and used by angry and frustrated Uyghur youth acting alone. Similarly, if we are to believe that ETIM is behind the disparate acts of violence that have occurred in Xinjiang in recent years, the organization is also poorly trained in tactical terrorism. No act of violence has held any real symbolic value, and no violence has been high profile. In trying to find truth in the available information on ETIM, therefore, I have come to two possible conclusions about this organization’s threat to China, the Olympics, and the world. First, the organization either does not exist anymore, even if it once did, or it is merely a shell trying to claim credit for acts with which it has no connection. Second, it is a poorly organized group with meager resources that is unable to accomplish any serious acts of terror beyond some isolated violence in remote locations far from international or even Chinese attention. Whichever is true, one must ask why the U.S. ever declared this organization a dangerous terrorist group? Was it done entirely out of political expedience to court China’s inclusion in the Global War on Terror? What intelligence do we actually have that this organization poses a threat? Is it even as legitimate as the flawed intelligence about weapons of mass destruction in Iraq that led us into a tragic war? Are we merely relying on the intelligence of China and the Central Asian states concerning Uyghur terrorism? These are questions that somebody in Washington should be asking, perhaps at the House Permanent Select Committee on Intelligence. Afterall, our recognition of the ETIM as an active and dangerous terrorist organization has facilitated further repression in Xinjiang, and somebody should be checking the facts before we keep sending the lambs to slaughter. I saw the excerpt for this post at Registan.net, but am thankful that I clicked over to read the whole article. I visited Kashgar for the first time last November and have been trying to make sense of what I saw and felt then with what I am seeing now on the news. Your article summarized and made clear a lot. Thank you. The Next “New Thing” From Rakhat? Will it be a Long, Hot Summer in Central Asia?